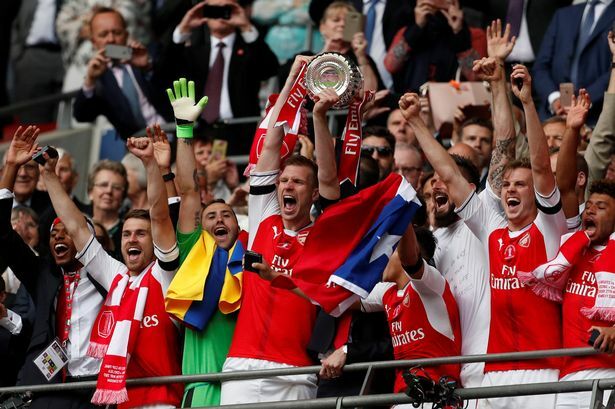 Arsenal won the FA Cup for the third time in last four years after a 2-1 win over Chelsea in a beautiful atmosphere at Wembley Stadium. The Gunners made a new record with the most trophies in the FA Cup history – this was their 13th, and Arsene Wenger become the most successful manager in the oldest cup competition in the world with s his 7th FA Cup title. We saw a brilliant game and pretty entertaining football but in the end, we can certainly say the better team won the trophy. Arsenal was aggressive from the first second and they took the lead after only five minutes. With a little help from his hands, Sanchez squeezed through Chelsea’s defense and scored easily with his right foot. The referee Anthony Taylor talked with his assistant about a possible offside and his decision determined the flow of the game. After an early goal, Arsenal kept attacking while Antonio Conte’s players looked confused and the Gunners had two great chances to double the lead, but Gary Cahill saved Chelsea with goal line clearance in the last moment. The Blues stayed alive and they picked up themselves till the half time but their best players Diego Costa and Eden Hazard looked quite indifferent. First twenty minutes of the second half was the same story as Arsenal played with more energy. Victor Moses received a second yellow card for obvious diving, and Chelsea found themselves in even bigger trouble. But with ten men, they suddenly started to play aggressively and Diego Costa equalized in the 76th minute. Willian’s cross was perfect, and like a real fox in the box, Costa tricked Mertesacker with a wonderful first touch and then took a great half-volley to beat Ospina. It was only a moment of joy for Chelsea’s supporters because Arsenal was on top again just seconds after the kick-off. Giroud, who just entered the game, sent a precise cross for Aaron Ramsey and the Welshman’s header beat Courtois. Celebrities beware! Wenger’s players continued to hurt Chelsea on the counter and Ozil hit the post as a result of a superb individual effort. Nothing noteworthy happened until the end, except the fact that Conte replaced his most dangerous player Costa with Michy Batshuayi in the 88th minute, a move which is a hard to explain. Arsenal won the record 13th FA Cup trophy in their history and Arsene Wenger became the first manager with seven FA Cup victories. These two achievements saved the Gunners’ season which looked below-par until now. The French manager knows that Arsenal‘s supporters are divided about him, so now he has to be pleased with this success counting that he will be at the helm for another year. If he stays and keeps major players like Ozil and Sanchez, with some new blood within the squad, the next season could see Arsenal’s return to top four. On the other side, Antonio Conte’s team looked uninspired after they won a domestic title, and they definitely didn’t deserve to win the cup. Costa’s equalizer gave them a glimmer of hope, but other than that, it was a disappointing performance from the champions.